I've been playing with animation software and have started to make some characters as test puppets to see how they look when animated. I have an idea for a film so I am going to try and teach myself the skills to make it. I made these characters by painting onto very thin plywood so even if I never get a film made this could be a way to put paintings together. Maybe I will have to learn marquetry too. 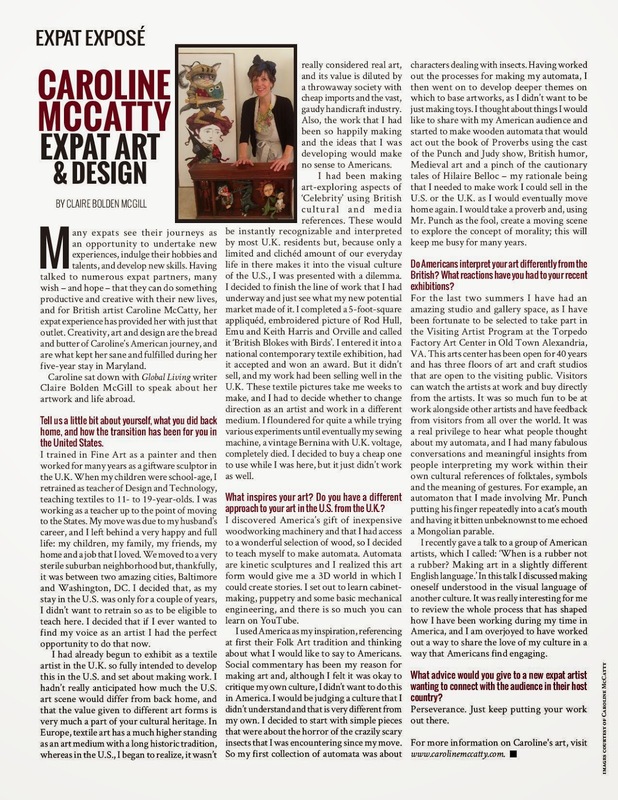 I am featured in this months Global Living Magazine. I have only uploaded a picture of the article below. In the article I got the chance to explain how my own move to the States has shaped my work and what an immense privilege it has been to have the chance to live for some time in another culture. It is very cold in my workshop so I have been keeping warm indoors whilst mocking up puppets. I can't wait to make him in wood though!